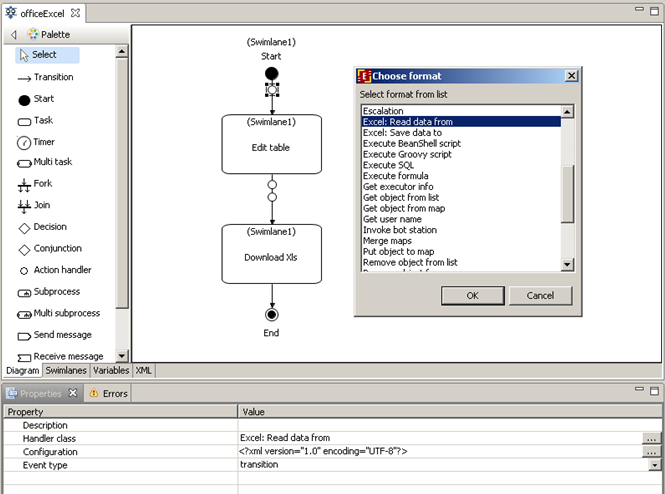 2.2 Creating business process graph. They are used for docx, xlsx files handling. 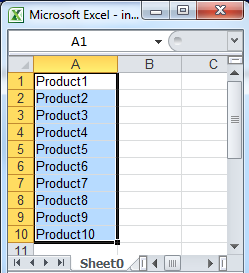 This process is an example of Excel handlers usage. 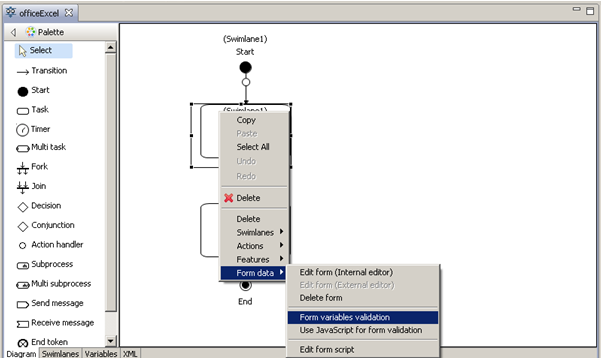 It reads data from the input file (via "Excel: Read data from" handler), then the data is presented to user in editable form. 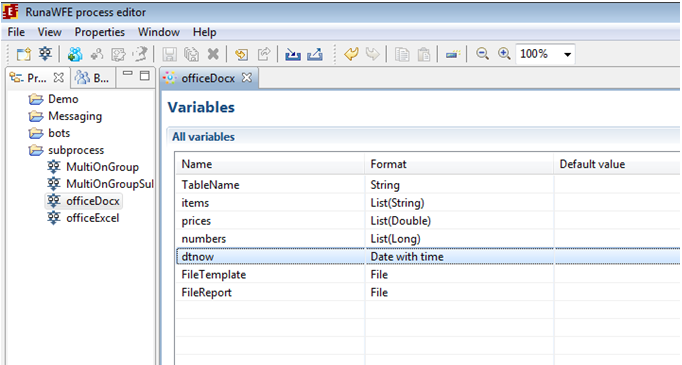 Next Excel handler "Excel: Save data to" saves the edited data into file using input template. 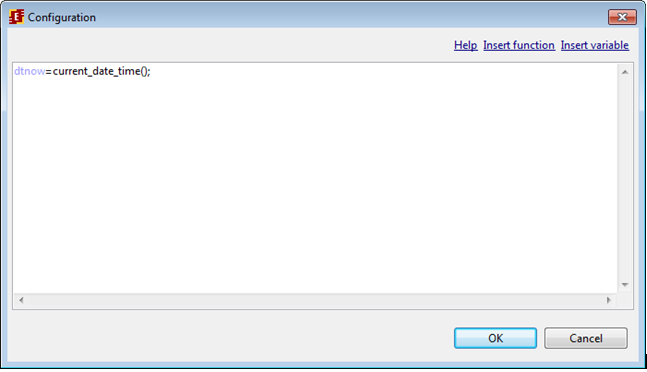 Then process goes to "Download xlsx" and user can download the resultant .xlsx file. Place action handlers on the transitions. Handlers class and configuration are set further on. There's no initializer for this swimlane because it is used in the Start state and is initialized by the user who starts the process. 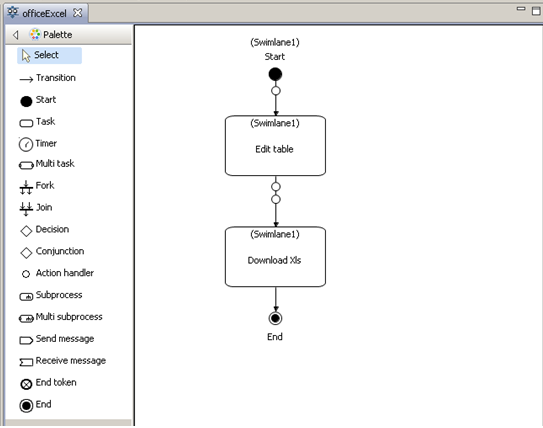 This swimlane is used for all the rest nodes that require a set swimlane. To set a swimlane select the node and in its properties in the Swimlane/Value field choose "Swimlane1". Next create variables. Go to the "Variables" tab and click on "Create" button. 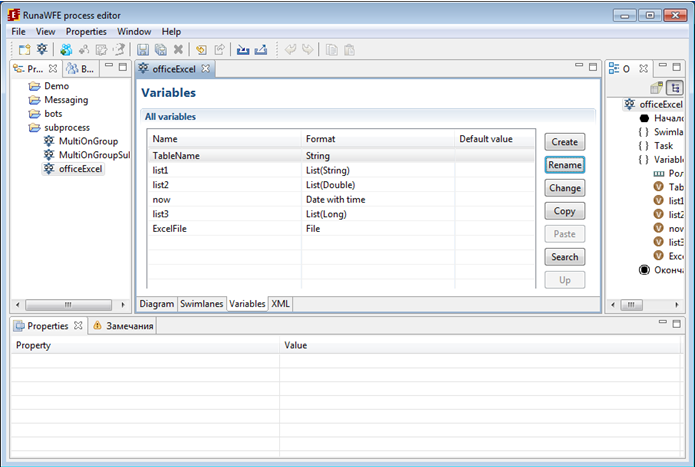 Type in the new variable name and select its format. See more detailed description of the variables further on. 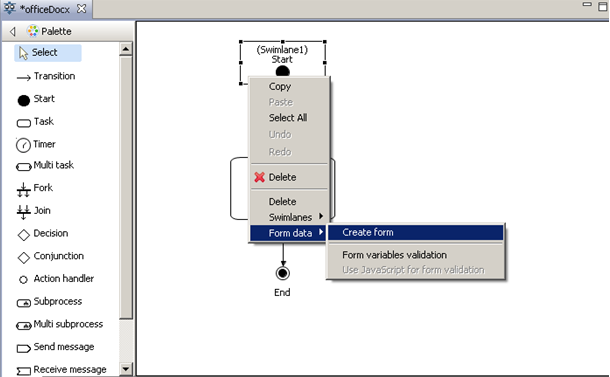 Right click on the action node and choose "Form" > "Create form" command. 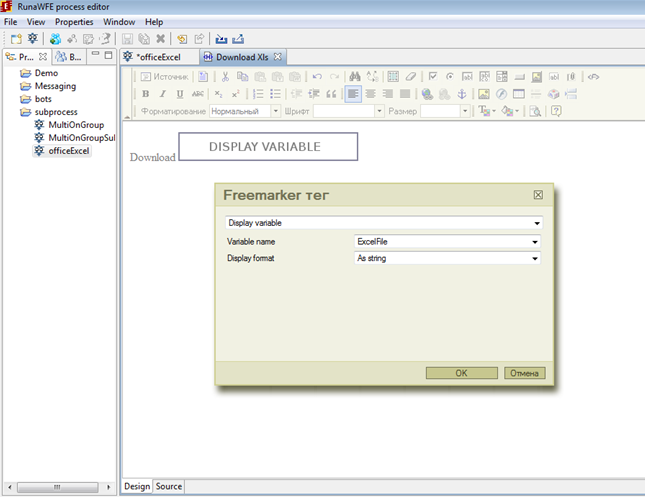 Freemarker tag "Variable input" to input "TableName" variable. 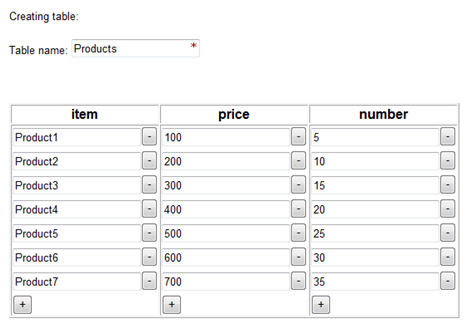 In “Variable name” field select “list1”, “list2”, “list3” respectively for each of the three tags, that are placed in cells “Name”, “Price”, “Count”. Similarly the form for "Download xlsx" is created. 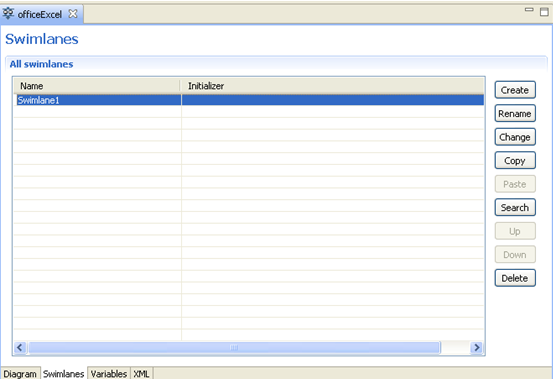 It is used to download the resultant .xlsx file with table. 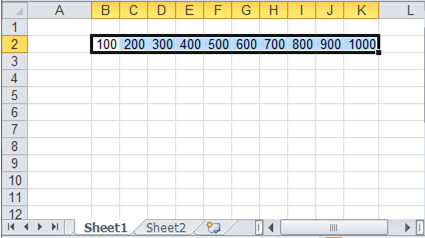 The first handler is used to read data from Excel file. The second action handler defines the date and time of .xlsx file creation. The "now" variable are initialized with the result of the “current_date_time()” function. 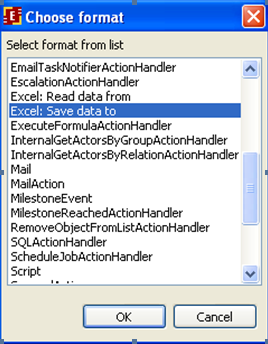 The third action handler is "Excel: Save data to" is used to save data to Excel file. 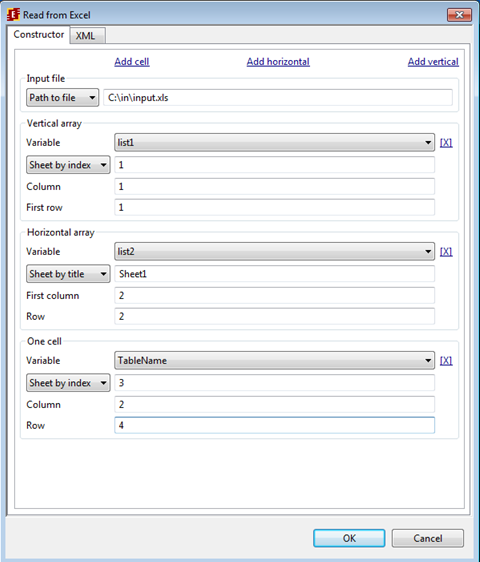 The rest parameters are set according to data positions of the input template file. 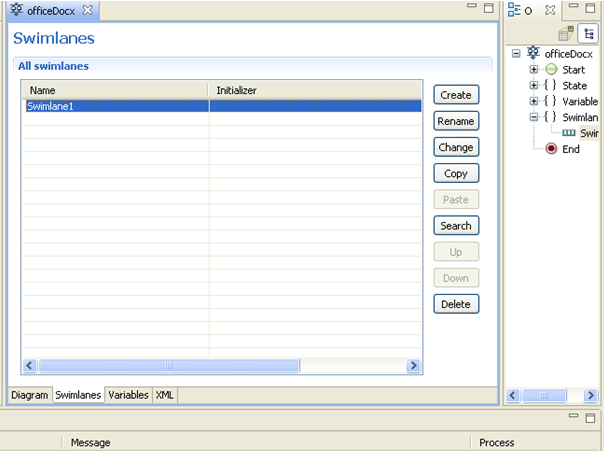 To deploy created process to the WFE Server use "Export process archive" with "Export to WFE server" option set. 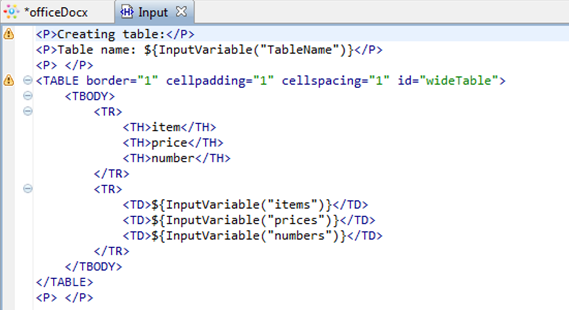 After starting the process the Excel handler triggers and data from the input file is saved into variables. 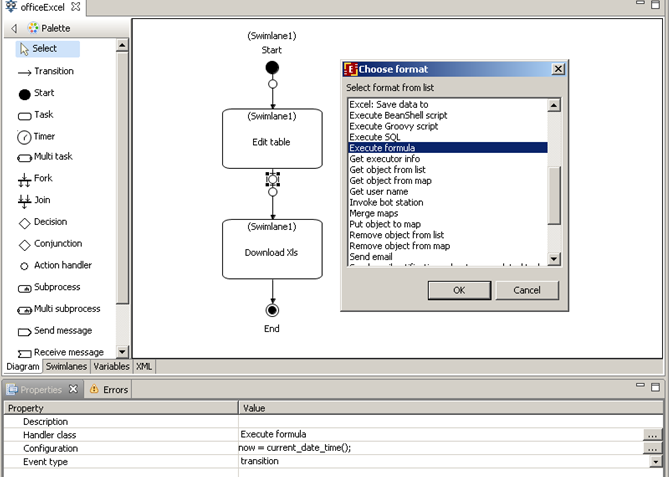 This file was created with the help of given handler configuration and input template file. 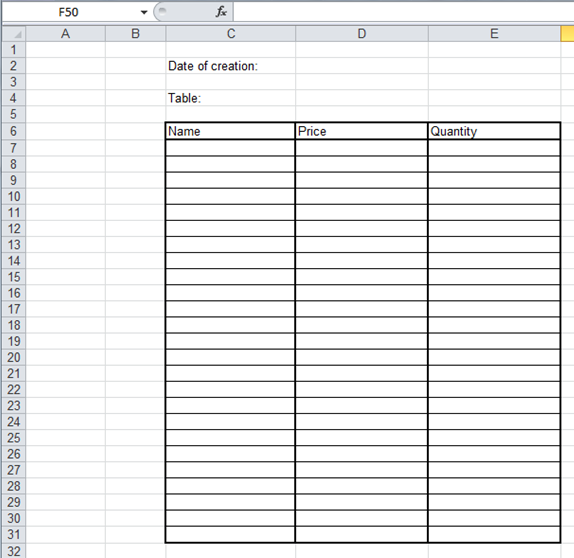 On the start form of the process user creates table, fills it in with data, types in its name. Then DocxHandler is triggered. 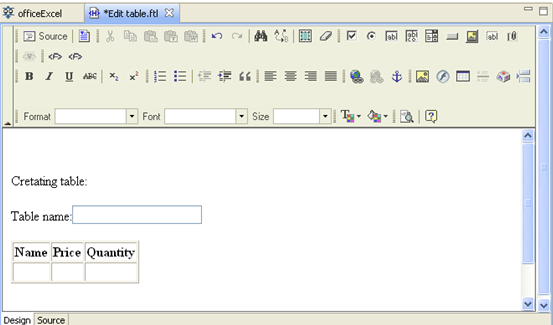 It creates .docx file using input template file and then the style is applied to the table. Then a link to download the created file is generated. Place 2 action handlers on the transition to the action node. Handlers class and configuration will be set further on. "Swimlane1" has no initializer because it is used in the Start state and is initialized by the user who starts the process. 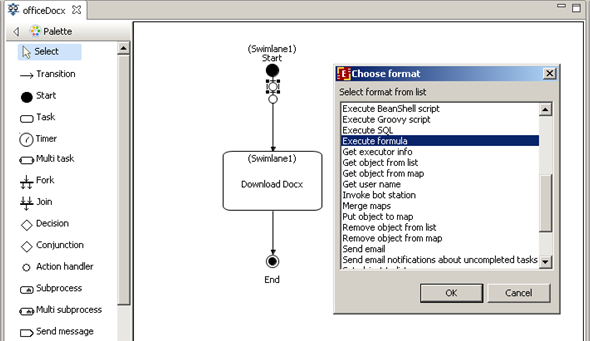 Also this swimlane is used in action node “Download Docx”. 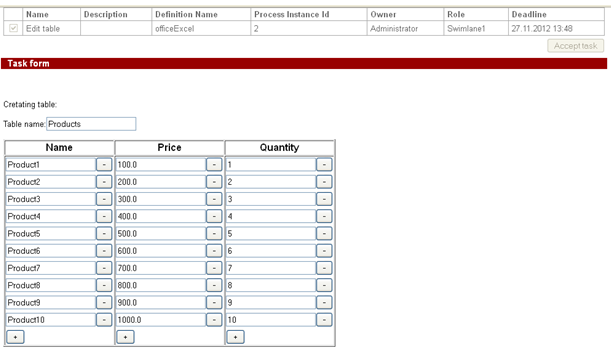 To set the swimlane select the node and in its properties in the Swimlane/Value select "Swimlane1". 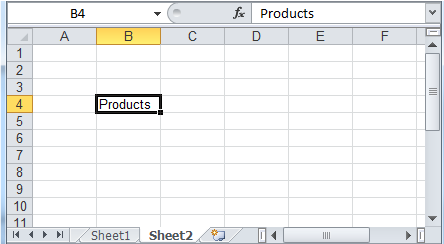 To create variables go to the Variables tab and click on Create button. 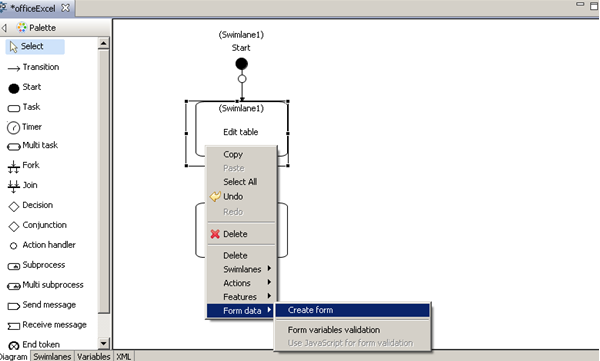 Type in the variable name and select its type in the dialog. A more detailed variable description is further on. 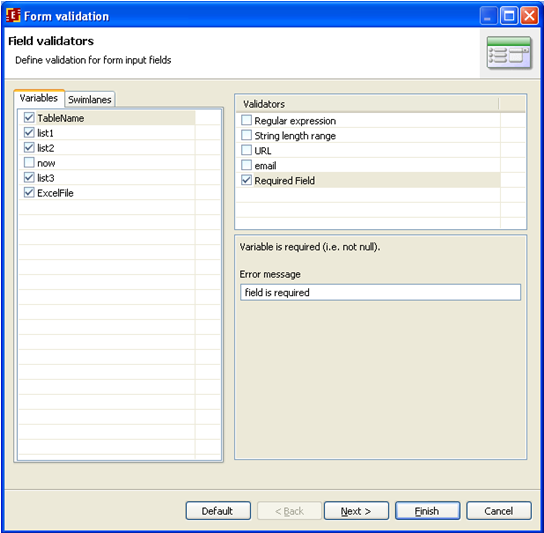 Then we create validation file and set the variables validation. 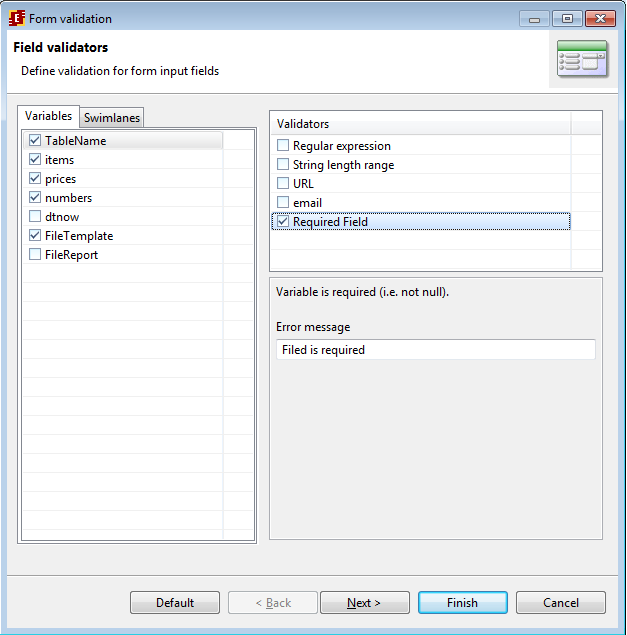 All the variables on this form must be set, so we use "Required field" validators. 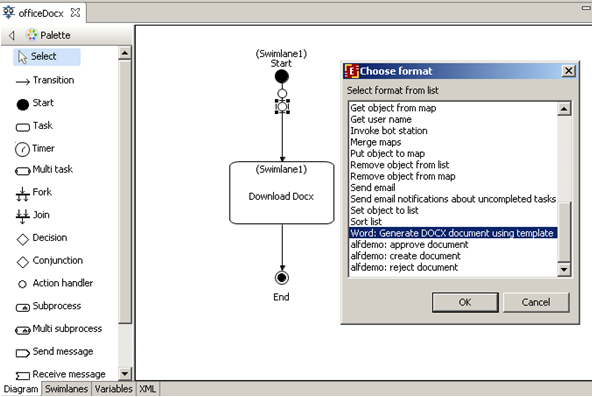 Similarly a form for “Download Docx” is created. 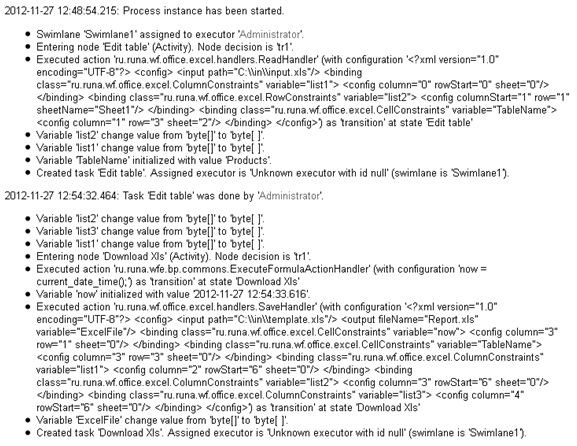 It is used to download created .docx file with table. 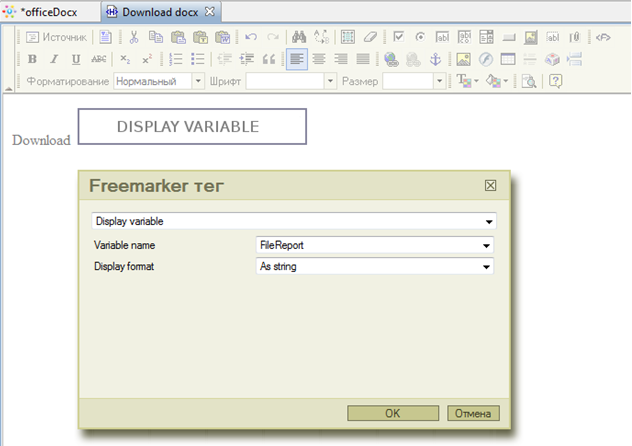 We use freemarker tag “DisplayVariable” here and set “FileReport” variable in the Name field of the configuration. The first handler is used to define the date and time of the .docx file creation. The second handler is “Docx handler”. It is used to save file in .docx format. 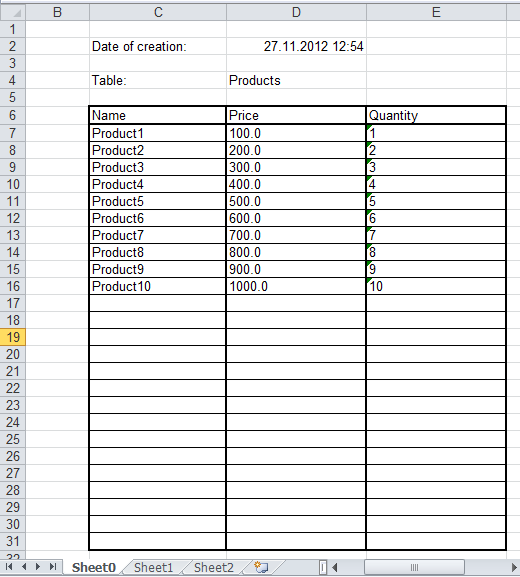 Let's create input file (template) right in business process, see details in the next section. 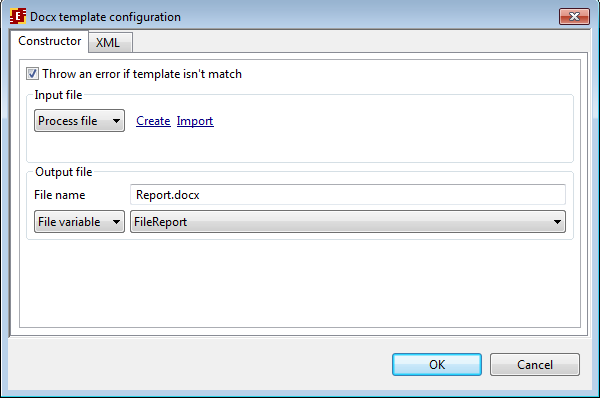 As the output file we use file name Report.docx and file variable that will contain link to the created docx file. 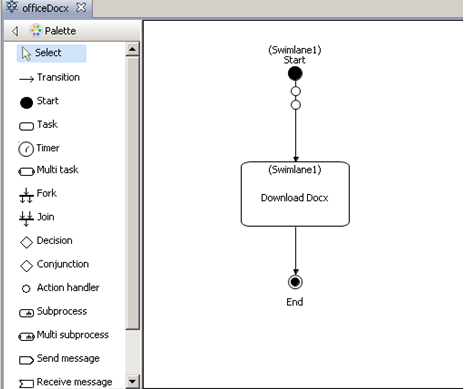 Let's create docx template file right in the business process. 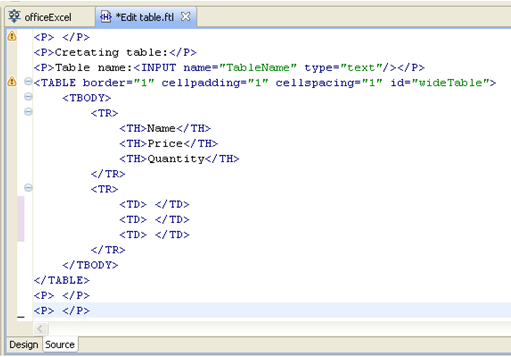 In order to create new table style in template open the corresponding menu by ALT+CTRL+SHIFT+S shortcut and select "Create style"
Then set the created style for the table. The steps to create style differ depending on the office version and can be found in the office help. Deploy created process to the server with the help of "Export process archive" with the "Export to WFE server" option set. When the process instance starts we get the following form. 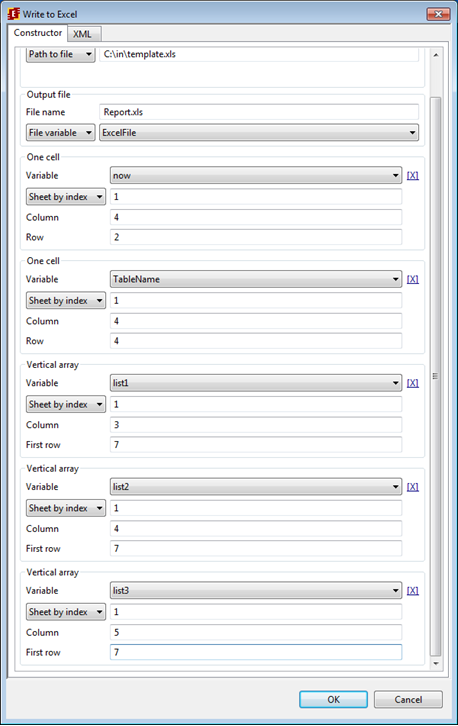 This file was created by the configuration set for the handler and "mystyle" style was applied afterwards. This page was last modified on 23 May 2014, at 17:53.